Descriptive and evaluative annotations of more than 1,000 books and articles in religious education and related fields are featured in this guide. Since religious education draws necessary guidance from other disciplines, pertinent literature is canvassed from theology, philosophy, and history of education; behavioral studies of religion and education; and multidisciplinary treatments. Special care has been taken to include materials that represent the interfaith and international aspects of the field. A bibliographical essay that interprets and evaluates positions and trends is included in each category. A resource for scholars, students, historians, and researchers. Educational theory is explored as it has influenced and provided insights for religious education. The vast literature in the theory and practice of religious education is dealt with in several categories. The section on theory explores basic issues, important positions, and major figures. The section on administration deals with planning, organization, management, and supervision. Program, curriculum, and method are considered together because they so often overlap in the literature. Since religion is a persistent concern in schools and in institutions of higher education, special sections are devoted to the issues involved and the proposals put forward. 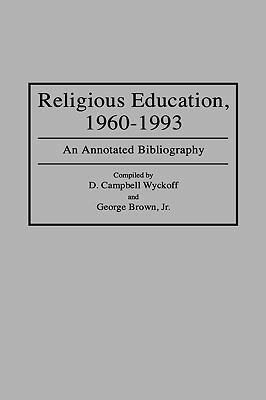 A final section covers reference works.Wyckoff, D. Campbell is the author of 'Religious Education, 1960-1993 An Annotated Bibliography' with ISBN 9780313284533 and ISBN 0313284539. Loading marketplace prices 154 copies from $1.98 How does the rental process work?